PJammin® for Kids With Cancer Success! 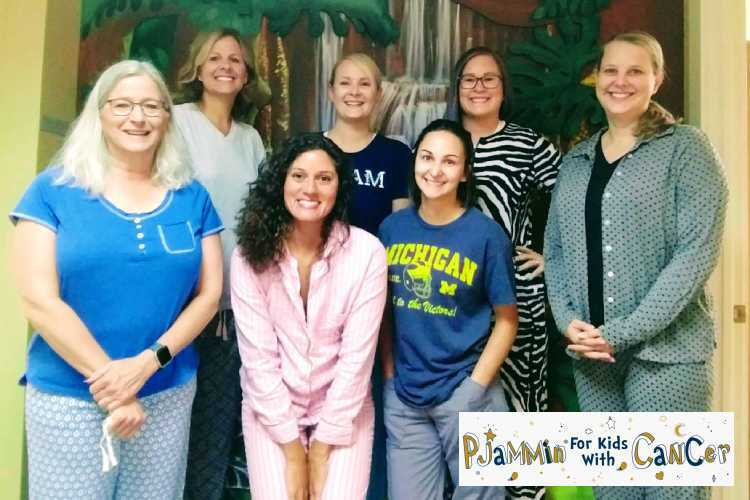 During the Month of September, Everyone in our office, our wonderful patients, and The American Childhood Cancer Organization (ACCO) wore PJs to raise money for children who are currently battling cancer. Thank You For Supporting PJammin® for Kids With Cancer. Because pajamas are what these cancer stricken hospitalized children wear every day. They call it their warrior clothes and on September 12 we’d like to do what we can to be warriors for them. Children with cancer often spend months, even years, living in their pajamas at home or in the hospital as they undergo critical treatments such as chemotherapy, radiation, and surgery. During this time, they frequently miss school, time with siblings and friends, and other normal childhood activities. Instead, they rely solely on their family and medical team to help them through this difficult time in their lives. Full details from our PJammin® for Kids With Cancer. We had 1 day to dress up in pajamas and the rest of the month to raise money. For every child who wore pajamas to their appointment on September 12th we donated $5. For every Facebook picture this day we will donate $3. Some fun pictures from our pajama day! It was a great month for a amazing cause so thank you to everyone who participated to help children who are currently battling cancer.